Our range of products include top and body sticker labeling machine. Owing of our extremely talented team of professionals, we are engaged in offering excellent quality Top and Body Sticker Labeling Machine. The offered labeling machine is manufactured using the best quality components and advanced technology in adherence with industry standards. 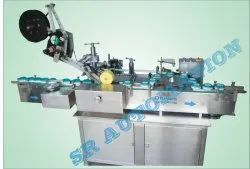 Used for applying 1st sticker on top side & 2nd sticker on body or side surface of any type, shape & size of container, this labeling machine is tested on various quality measures in order to maintain its flawlessness. Clients can avail this labeling machine from us at nominal prices.